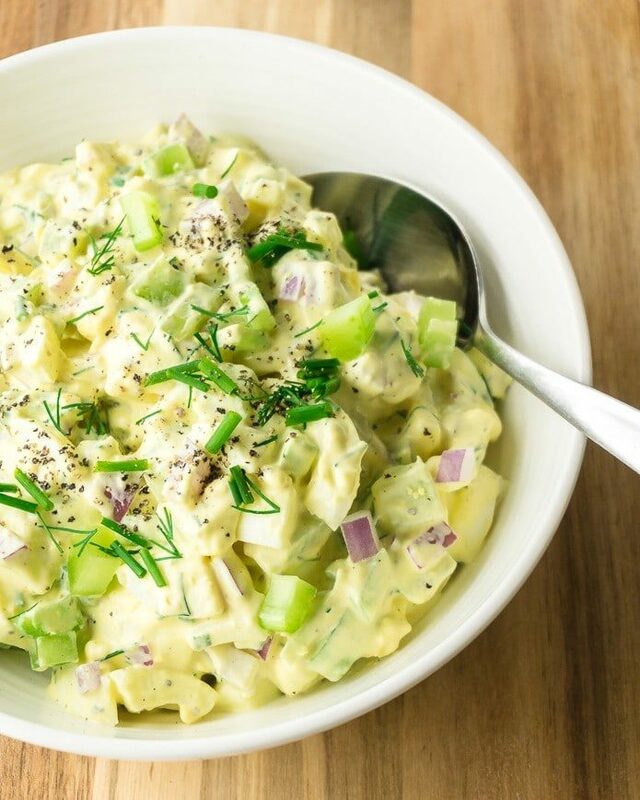 This delicious keto egg salad is creamy and velvety, with a zippy mustard dressing and crunchy celery. 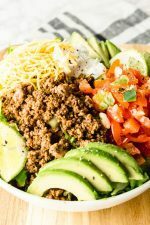 If you need a quick dish to bring to a BBQ picnic, or an easy recipe to pack in your lunch, this is a recipe you’ll definitely want to try. 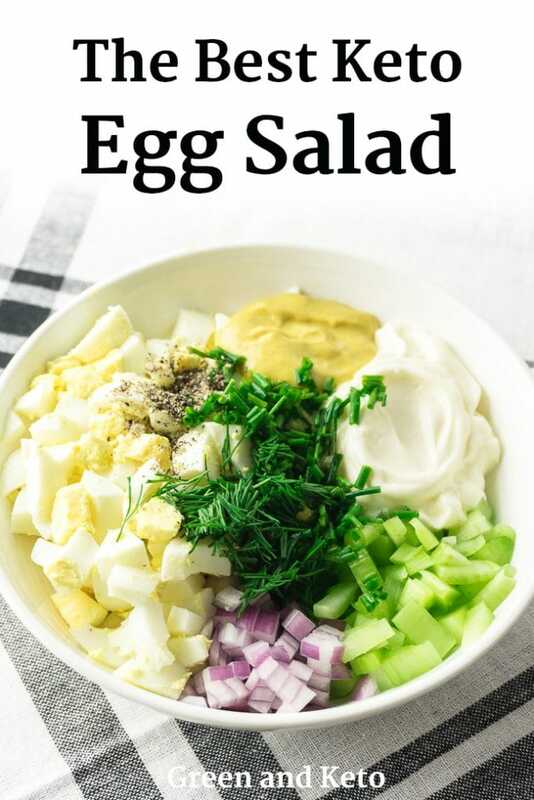 Keto egg salad a simple, make-it-in-your sleep type of recipe. It’s easy to pack for lunch, ideal to batch cook for meal prep, and infinitely customizable. 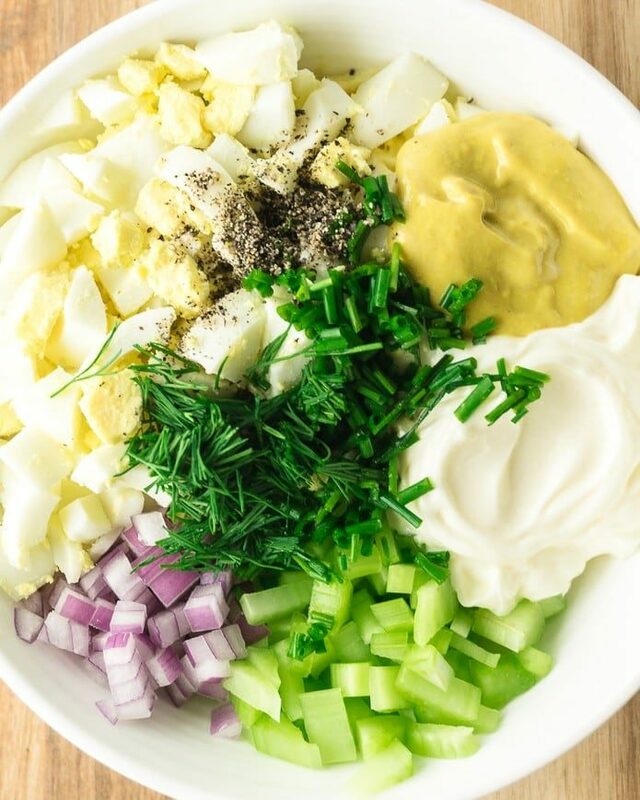 Egg salad requires only a handful of ingredients and takes almost no time at all to prepare. Plus, it’s one of those rare dairy-free, vegetarian keto recipes — so be sure to keep this one in your back pocket. This recipe starts off with, you guessed it, hard-boiled eggs. My favorite way to make hard-boiled eggs is in my Instant Pot. What else goes into egg salad? I like to make a dressing with sugar-free mayo, Dijon mustard, salt, and pepper. For freshness and crunch, I add chopped celery, minced red onion, dill, and chives. To make egg salad, you first need some hard-boiled eggs. Everyone seems to have their own trick for making perfect hard-boiled eggs. Some people start in cold water, some start in boiling water. Some people add vinegar to the water, some add baking soda. For me, pressure cooking in the Instant Pot is the best and easiest way to cook perfect hard boiled eggs every time. Check out my recipe for Instant Pot Boiled Eggs. You can also make great, easy-to-peel, hard-boiled eggs on the stove. To do this, you’ll first bring a large pot of water up to a rolling boil on high heat. Make sure to choose a lidded pot that is large enough to fit all of your eggs with room to spare. Then, once the water is boiling, add the eggs. I like to do this with tongs or a slotted spoon to avoid any splashing water. Place the lid on top, reduce the heat to low, and simmer the eggs for 12 minutes. After they have cooked, take the pot off the heat and immediately transfer the eggs to an ice bath. Time to use those tongs again! Let the eggs chill in the ice-bath for at least 10-15 minutes. This will stop the eggs from over-cooking, and cool them off enough so that you can peel them without burning your fingertips. Why does this method work? 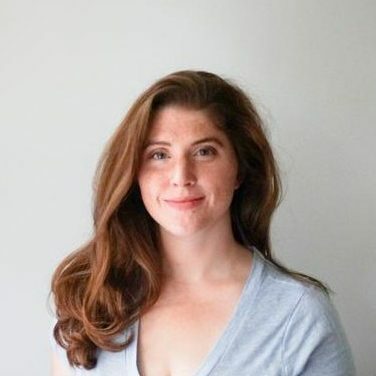 A hot start encourages the proteins in the egg white cook, bond to themselves, and shrink — preventing the egg white from sticking to the membrane connected to the shell. Then, quickly chilling the cooked eggs in the ice bath stops the cooking process — which prevents overcooking and gray yolks. Chilling the eggs also firms up the egg, making it easier to peel. When shopping for a keto-friendly mayo, look for a simple ingredients list with no-added sugars. At it’s simplest, real mayonnaise is made from eggs, oil, vinegar, salt. Here are some storebought mayo options to buy on the keto diet. Duke’s – My favorite mayo brand, with no added sugar. If you’re from the South, you’ll know about Duke’s. They are slowly increasing their distribution area — so you may be able to find it in your local grocery. Duke’s does use soybean oil, which some people prefer to avoid. If that’s you, read on more options. Primal Kitchen’s Avocado Oil Mayo is another great pick for keto friendly mayo. It’s made from avocado oil, which many people prefer for it’s higher concentration of mono-unsaturated fat. Chosen Foods is another keto-friendly brand that makes a wide variety of avocado oil-based products. They do add a bit of honey to thier mayo, but not enough to make a huge difference to your macros. And if you’re feeling the DIY spirit, you can always make your own mayonnaise at home. It’s easier than you think! And you can control exactly what ingredients go into it. 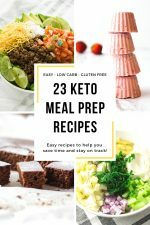 Eggs are a staple of the keto diet – and for good reason! Eggs are loaded with nutrients, vitamins, minerals, protein, and healthy fats. Each large egg has grams of fat, 1 gram of carbs, and 4 grams of protein. The fat and protein in eggs will help you feel fuller longer, making it easier for you to resist sugary snacks. They may help reduce the risk of heart disease and improve cardiovascular health. A 2011 study (source) found eating eggs may be associated with a reduced risk of cardiovascular disease and cancer because of their high levels of antioxidants. Several other studies (source), have found that eggs may help lower blood pressure as well. Egg yolks contain specific antioxidants important for eye health that can reduce the risk of cataracts and glaucoma. Eggs also contain choline, which is essential for brain health. 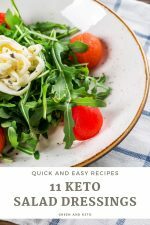 Keto egg salad is very customizable. 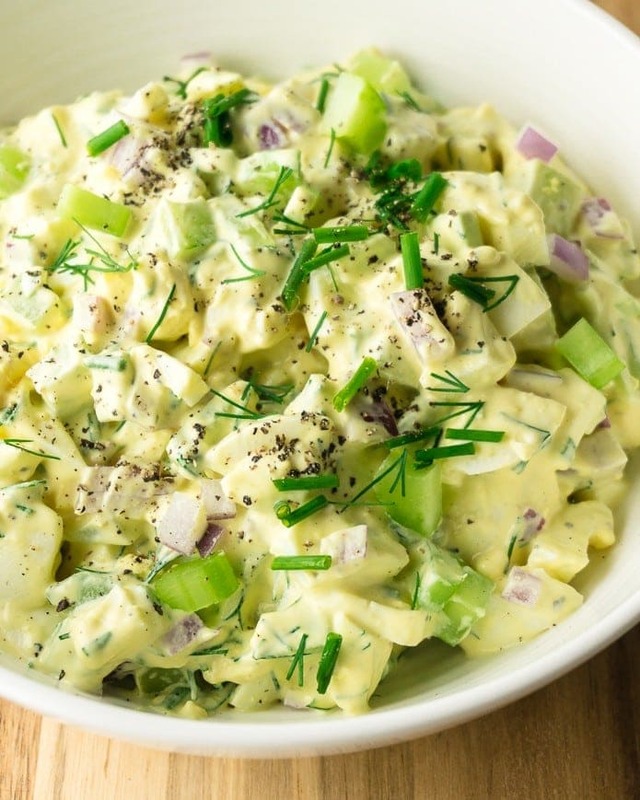 You can add or subtract some ingredients to make this egg salad better suit your taste. Not a celery fan? That’s okay, I forgive you, you can just leave it out. If you like dill, you can add a tablespoon or two of finely chopped dill pickles to the mix. Top egg salad with pickled onions or capers. Try a “loaded egg salad” with bacon, cheddar, and chives. 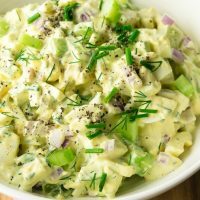 This delicious keto egg salad is creamy and velvety, with a zippy mustard dressing and crunchy celery. Fill a large pot with water and bring to a boil. Carefully place eggs in the hot water. Place the lid on the pot, reduce heat to low, and cook the eggs on a bare simmer for 12 minutes. After 12 minutes, immediately transfer the eggs to an ice bath and chill for 10-15 minutes, then peel the eggs. Place eggs on an egg rack or trivet. Place 1 cup of water in the inner pot of the Instant Pot. Seal the lid, and set the pressure cooker to cook 5 minutes on manual/high pressure. Then, let the pressure release naturally for 5 minutes. After 5 minutes, carefully release any remaining pressure in the pressure cooker. Remove the eggs from the pressure cooker, transferring the eggs to an ice bath. Chill for 10-15 minutes, then peel the eggs. Coarsely chop the hard-boiled eggs. 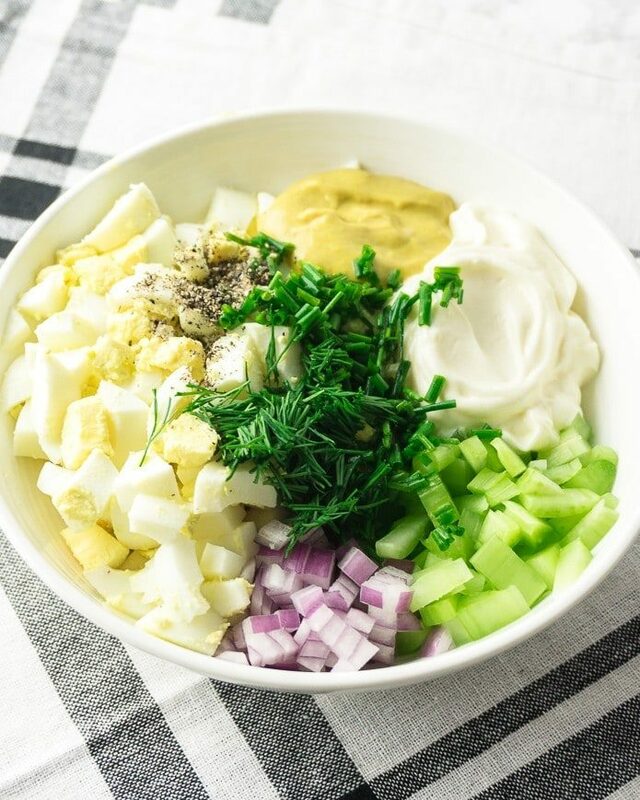 In a medium-sized bowl, stir together the mayonnaise, mustard, celery, red onion, chives, dill, salt, and pepper. Stir in the chopped eggs. Taste for seasoning, and add more salt and pepper if needed. Homemade mayonnaise can be used instead of store-bought. Egg salad can be stored in an airtight container for up to 3 days. See post for recipe variation ideas. The nutrition information is provided as a courtesy and is approximate only. It was calculated by Nutritionix with the recommended brands and ingredients. All brands are different, so please verify the macros with your specific ingredients to ensure accuracy.